– for intense sequences of violence and action, some startling images and a scene of suggestive material. When thinking of the classic tales of Sherlock Holmes, it isn’t natural for names like Guy Ritchie, Robert Downey Jr. and Jude Law to come to mind in association. That is, until now. 2009 sees the return of the famed detective to the big screen, reinventing the beloved character for a new generation. Ritchie fashions the Holmes world for much more of the MTV type of audience. Although this isn’t exactly the unashamedly modern approach that a film like A Knight’s Tale took, Holmes has become not only a brilliant mind, but also some sort of action hero. But does it work? 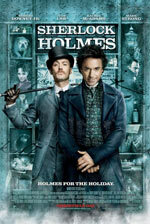 The acting brilliance of Robert Downey Jr. singlehandedly makes this latest incarnation of Holmes a success. Downey is especially convincing as the detective, and his charm, humor, and intensity make the character a joy to watch any time he’s on the screen. Holmes is probably most widely envisioned as a high class, no-nonsense master of deduction, so picturing such a character as an unkempt eccentric artist with bad drinking habits, a fierce right hook, and no tact seems far-fetched. Ritchie and company take small, little known traits about Holmes from Sir Arthur Conan Doyle’s writings and expands on them – like his fighting talents. It all adds up to a much more contemporized version, something you would never have seen earlier in the 1900’s when Sherlock was first depicted on screen. Also, Ritchie’s filmmaking techniques aren’t exactly “classic” either. Much of the look and feel of the film is the stuff you’d find in any given action movie. So Ritchie’s Sherlock Holmes is a bit schizophrenic. It’s a marriage of classic storytelling and characters with the popcorn moviegoer mind set. It’s not nearly as drastic as updating War of the Worlds, but this Sherlock Holmes is certainly targeted at those who took to Downey as Iron Man (and the trailer to the pending sequel was without surprise attached to this movie in the theaters). Violence is probably the biggest red flag for Sherlock Holmes. We see several fist fights and such throughout the film, two of which feature Holmes planning out brutal takedown assaults which show the punches and hits to his victims in slow motion as he describes what will happen — for example: broken jaw, dislocated jaw, broken ribs, a punch to the liver, etc. After we see this occur in slow motion, we then see Holmes carry out the attack at regular speed. Other things include a man being boiled to death in his bathtub, a man catching on fire and falling out a window to his death, two different hangings, some assorted bloody scratches and cuts on characters, some butchered pigs in a slaughterhouse, and the worst being a bloody, slightly gory shrapnel wound on a person’s neck and back. There is also a brief sensual scene where Irene kisses Sherlock before he passes out and later wakes up naked and handcuffed to a bed with only a pillow covering his crotch. Despite the over-contemporization of the filmmaking style (slow motion, lots of action, quick edits, and the overall tone of some sequences), the latest take is a pretty fun one. And despite Downey already being a bit old to be launching a possible new franchise (alongside the already successful Iron Man series), he makes a great Holmes, and I kept thinking how fun it was to see him play the character — and am hoping he’ll do so again in future films. Law also gives a delightful unique spin on Dr. Watson, and the two make a pretty fantastic team. The dialogue (co-written by a couple fairly newcomers along with an experienced action writer) is rather solid as well, giving Downey and Law plenty of memorable moments to work with. The action sequences are entertaining as well, even if it still feels a bit odd for such a film. It probably will take a bit for those familiar with older renditions of Holmes to wrap their heads around an action packed version, but in the end, Downey Jr. makes Holmes shine bright, and Ritchie’s efforts are rewarding. Those looking for a successful action/mystery blend will find a lot to like about the latest Sherlock Holmes… as long as they don’t mind it being packaged as such, that is. Moviegoers who are sensitive to spiritual topics will want to proceed with caution before screening the latest Holmes, though. From the opening scene which involves a foiled human sacrifice to many other mentions to cults and black magic, etc, the film has a dark tone for its central villainous plot that will certainly be unsettling to some viewers (luckily, it does have a redemptive finish, and those interested in more details should read the spoiler alert earlier in this review). Otherwise, Ritchie’s latest is a great time at the movies and a wonderful rebirth for the beloved super sleuth. 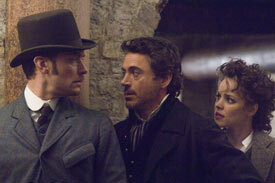 I look forward to more adventures of Downey and Law as Holmes and Watson. Posted in Reviews, TheatricalTagged action, book, Guy Ritchie, Jude Law, Mark Strong, mystery, Rachel McAdams, reboot, Robert Downey Jr.